The Fail Trigger Action has been improved and renamed to be more flexible and easier to use. The action is now called Trigger Log Message and now lets the user choose which log to log a custom message to when the trigger action is fired. This action will no longer prevent any other actions in the Trigger from running if it's included. This is so that you can have subsequent actions such as Send Email whenever you want to trigger a custom log message. You can still prevent the selected Trigger Event from running if the type of log message is set to Error and if the event is set to fire after the trigger is fired. 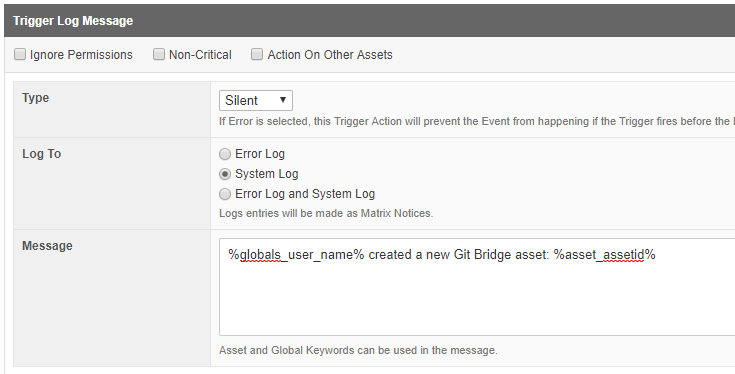 Asset and Global Keywords are now also supported in the log message. The Git File Bridge has been enhanced to allow you to checkout code from a tag or a commit ID. Previously, only branches were supported. This is useful if you want to manage your Git file updated using release tags rather than always pulling the latest code from a specific branch. A new %asset_permissions_info% keyword has been added that prints out all of the Permission settings for an asset in a JSON array. When editing an asset that is in Under Construction or Safe Edit, you can make it Live with a single status change if you have Admin access to it, using the Approve and Make Live option. Previously, this option wasn't available if the asset had a Workflow Schema applied to it, as you always had to first Approve the asset, and then make it Live. This was causing an unnecessary extra step if you just wanted to make publish the changes at the same time as you approved them. Now, if you have access to make the asset Live, you can use the Approve and Make Live option even when the asset is in Workflow. This option is also available to you if you are the approver of all Workflow steps when the asset is in Under Construction or Safe Edit. When using an E-Commerce Form Page, you can use several different keywords to print information about the order that has been processed such as %order_total% and %order_item_count%. These keywords are now available to use outside of the E-Commerce Form Page, for example when listing Order assets using an Asset Listing or viewing them using a Paint Layout. The Google reCAPTCHA feature that is available for Custom Form assets can now be controlled when editing the form in Edit+. Asset Morphing support has been added to Form Questions for Custom Form assets. 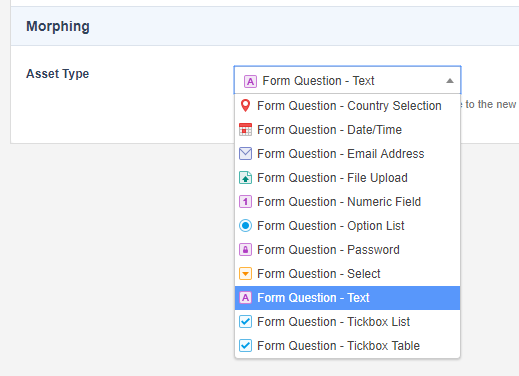 Similar to the recently added Metadata Field Morphing feature, you can Morph a Form Question by going to the Settings screen of it (requires Admin access to the asset), selecting a different type, and saving the screen. #11602 - Change TRIM asset map category name to "TRIM / HPRM"
Please see the Deprecations page for a full list of all past and future scheduled deprecations and removals. #11553 - File version error, wrong number of arguments. #11613 - Nested content type output empty in the Paint Layout when switching the nested asset. #11635 - Search page redirects to the create new screen when acquiring locks in detail screen of search page.